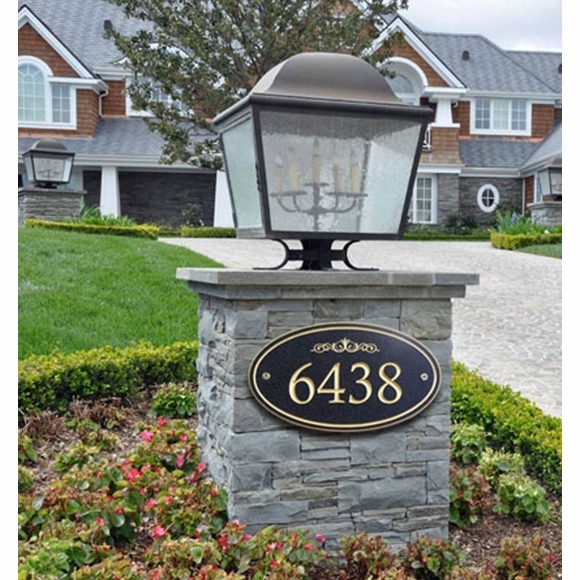 Oval Personalized House Plaque - - Stone Mill Avonite Home Address Plaque in elegant oval shape. Avonite is a resin that looks like stone but cuts like wood. It is similar to Corian® with UV properties for exterior use. Personalized oval house plaque holds up to four large numbers. Oval avonite plaque is coated with exterior acrylic enamel in three textured colors: blue, black (discontinued), and casablanca (off white). barn red, essex green, light navy, or black for use on casablanca plaques. Avonite house signs ship with gold screws for an extra touch of class.